This hotel was completely renovated in 2008 to offer its guests a place where modern, musical spirit and charms historical are mixed. Montreux- Pearl of the Swiss Riviera- is a place of music; spirit of the Jazz Festival, September Musical, Love-Boats. Montreux is closely related to the music. The hotel does a tribute. The hotel is designed on the theme of music. Each room is unique, dedicated to an artist who made the reputation of Montreux. You will sleep well with David Bowie, Aretha Franklin, and many others. Footprint of the historic character of the area, the house dates from 1616, the rooms were renovated in 2008 in a current style associated with the theme of "music." Particular attention has been paid to the decoration but also comfort. Each room has all the amenities: flat screen TV, Wifi. 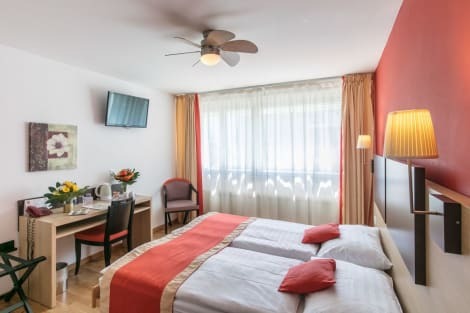 With a stay at Hôtel Bristol , you'll be centrally located in Montreux, a 1-minute drive from Chateau de Chillon and 5 minutes from Freddie Mercury Statue. This hotel is 14.7 mi (23.7 km) from Portes du Soleil and 0.1 mi (0.2 km) from Swiss National Audiovisual Museum. Idyllic setting on Lake Geneva in Switzerland-overlooking the Alps. Built in 1906 this Jewel of Belle-Epoque architecture offers a traditional and elegant atmosphere as well as a personalised and attentive service in true Swiss style. 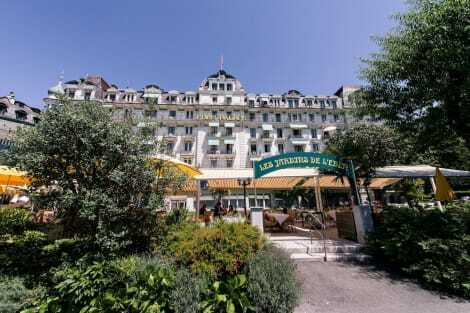 Fairmont Le Montreux Palace is member of Leading Hotels of the World. The hotel has 236 rooms and suites that are luxuriously furnished-offering both comfort and the latest technology. With a stay at Hôtel Bon Port in Montreux (Montreux City Centre), you'll be within a 5-minute drive of Freddie Mercury Statue and Chateau de Chillon. This hotel is 17.9 mi (28.9 km) from Portes du Soleil and 0.2 mi (0.3 km) from Montreux Casino. Enjoy regional cuisine at Safran, one of the hotel's 2 restaurants, or stay in and take advantage of the room service (during limited hours). Wrap up your day with a drink at the bar/lounge. Buffet breakfasts are available daily from 7 AM to 10 AM for a fee. Make yourself at home in one of the 154 air-conditioned rooms featuring minibars and LCD televisions. Satellite television is provided for your entertainment. Private bathrooms have complimentary toiletries and hair dryers. Conveniences include phones, as well as safes and desks. The exterior of the hotel is impressive and has been kept in it's traditional style. Located in southwest Switzerland, on the edge of Lake Geneva, with the snow-capped Alps as a backdrop, Montreux is a global attraction. Tourists come to witness the rich heritage, lush vineyards and beautiful scenery. Named the capital of the Vaud Riviera, due to its mild climate and palm trees, the town was a favourite haunt for the likes of Freddie Mercury and Charlie Chaplin. Stay in one of the many Montreux hotels and relish the fresh mountain air and tranquil setting this remarkable place can offer. There are countless excursions to be had, either into the mountains or via the lake. Take a paddleboat over to the Chateau of Chillon and witness the incredible views that stretch across Lake Geneva. Its fortified walls and romantic towers inspired the likes of Lord Byron, Victor Hugo and Courbet. With 1000 years of history to unveil, this castle is now a museum depicting life for the Court of Savoy and the Bernese bailiffs. If you want to stretch your legs, put on your boots and stroll along the lake promenade from Villeneuve towards Vevey for arguably one of the most stunning walks in Switzerland. For a closer look at the intricately terraced vineyards, head for Lavaux, now a UNESCO World Heritage Site. Meander along the hillside, tasting wine and taking refreshment as you go. For those seeking a more sedate option, scale 1600m by rail, on the Rocher-de-Naye railway and witness a spectacular view from the summit. Another exceptional trip by rail is via the Golden Pass Line. This train runs between Montreux and Bernese Oberland, offering panoramic views along the way. Visit the Place du Marche, where a statue of Freddie Mercury looks out onto Lake Geneva before trying your hand with a flutter at the Montreux Casino. Dine in style at the Fairmont Le Montreux Palace, which illustrates the elegance and grace of a bygone era. For the latest concerts or exhibitions, check out the Montreux Music and Convention Centre. NoSEOSITE_LEVEL_DESCRIPTION annual festivals held in the town include the Septembre musical de Montreux, which was originally founded in 1946. Freddie Mercury's Montreux Memorial Day normally held on the first weekend of September and the internationally acclaimed Montreux Jazz Festival. Held in early summer, musical interludes take place in various parks and concert venues around the town. Then there's the Comedy Festival in December and the Christmas Market, which bursts with gift ideas and plenty of festive cheer.